Inducted 2006. QB of 1974 Semi-Finalists, Played Pro Baseball for Phillies. Class of 1975. Johnson is one of a small group of Quincy Notre Dame graduates to have played professional baseball, but he also is remembered for quarterbacking one of the best football teams in school history. Johnson, a 1975 graduate of Catholic Boys, was a four-year starter on the baseball team as a shortstop and as a pitcher. He also starred on the Quincy American Legion team during the summer months. During his senior season, the Raiders reached the quarterfinals of the state tournament for the first time since 1952, and Johnson was named the team’s most valuable player. Near the end of his senior season, he was drafted by the Philadelphia Phillies and signed with them after graduation. He played in Pulaski, Va., Auburn, N.Y., and in Reading, Pa., making it as high as the Class AA level. He was the starting quarterback on the football team for two years, leading the Raiders to a perfect regular season as a senior. 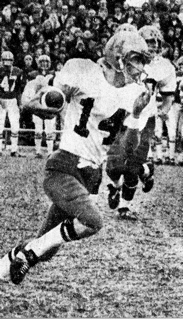 He passed for 752 yards and 11 touchdowns as he guided the 1974 team to the Class 3A semifinals. Johnson lives in Katy, Texas, with his wife, LeeAnne, and their two children, Christine and Andrew. He is the operations manager for Cameron Valves and Measurements in Houston, Texas.